My counter argument to my husband’s idea about living a global nomad life is that I have this belief that you need to have a “home base” to compare all your travels to, a “sugar pill” so to say. But in order to understand the country you live in you also have to spend some time traveling it. Well this summer, I decided to start that journey with my kids. Will they remember it all at ages 2, 5, and 7 years old? May not all of it, maybe not at all, but just like our international travel for this age, I believe the process of travel is just as beneficial to the future as the sights we visit. So off we went on a 3 week expedition through 10 states. My sons had the benefit of flying to Denver to meet their grandparents, while my husband and I drove with our 2 year old to meet them. We left on a Friday night and planned for a Sunday evening arrival in Denver. During my drive time, and for a few days after our arrival in Colorado, my boys were going to do some RV camping and touring of northern Colorado and Pike’s Peak. This meant my husband and I experienced the long forgotten life of having just one child! 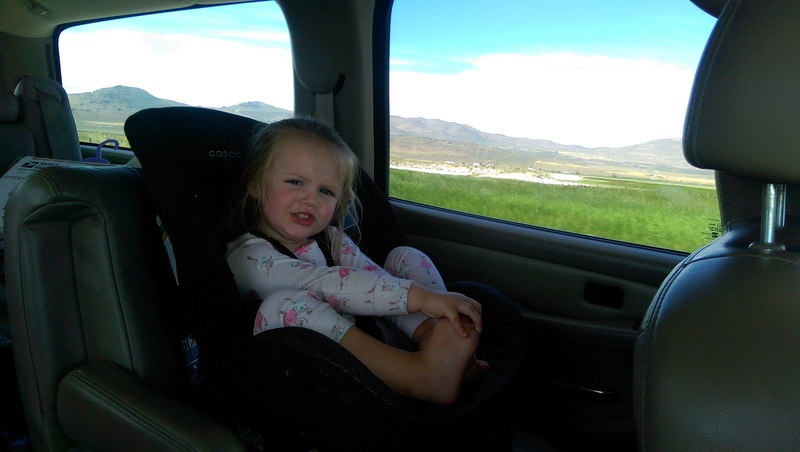 We loaded up the Yukon and hit the road at 7:30 p.m., hoping that after a movie or two our 2 year old would fall asleep and my husband and I could trade off driving and sleeping to make as much headway through the night. We made it to the Oregon/Idaho border at 3:30 a.m. before my husband decided it was time for us to stop and we both took a 3 hour nap at a rest stop. I woke at 7:30 a.m. local Idaho time, after the 1 hour time adjustment. I decided that since my daugher was still asleep, I needed to get moving and try to shorten the distance between us and Salt Lake City as much as I could as this would be our first hotel stop. This allowed my husband and her to sleep another hour as we pushed further along into Idaho. 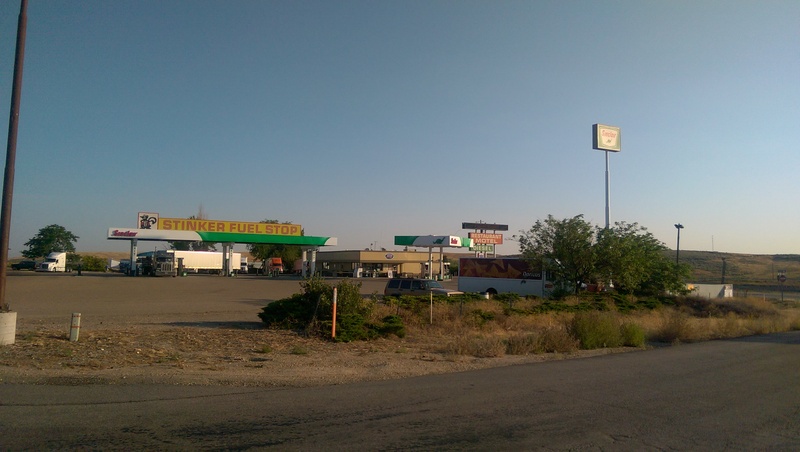 I needed a personal stop just before Caldwell, Idaho where I found a Sinclair, “Stinker Fuel Stop” that had free showers and nice changing room/toilet stalls in the restrooms. I quickly changed and we headed off again. Great stop for free showers near Caldwell, Idaho. As my 2 year old woke up and became more alert, we all decided it was time for breakfast. We were coming upon Twin Falls, Idaho and figured it was as good as any place to stop. 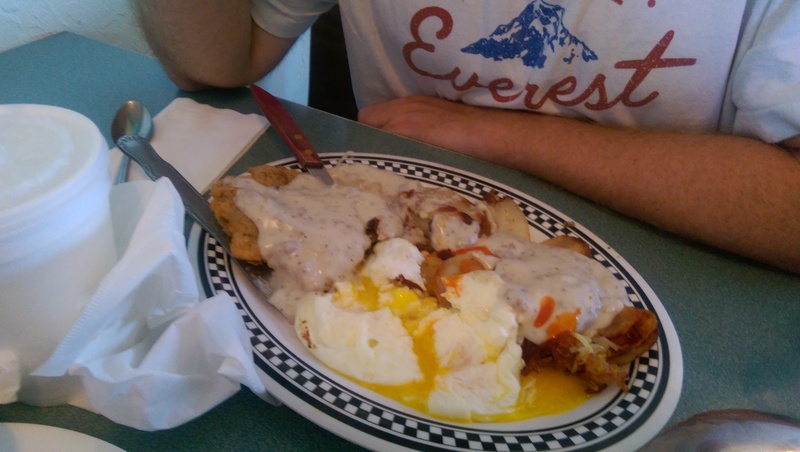 We used a quick Yelp search for recommendations and came up with a family style diner called Choate’s Family Diner. It did not disappoint! Inexpensive, delicious food was just what this road trip needed! My daughter got a giant pancake, me an egg, bacon and 1/2 order of hashbrowns while my husband had a full chicken friend steak breakfast plate, $20 after tip fed us all. Choate’s Family Diner was a great breakfast stop in Jerome, Idaho. Just outside of Twin Falls. From here we ventured on to the next gas station to fill up the tank and fill up our stock of beverages for the next hundred miles to the Utah border. If we didn’t already know we were in America, the special at the fountain drink station said it all. 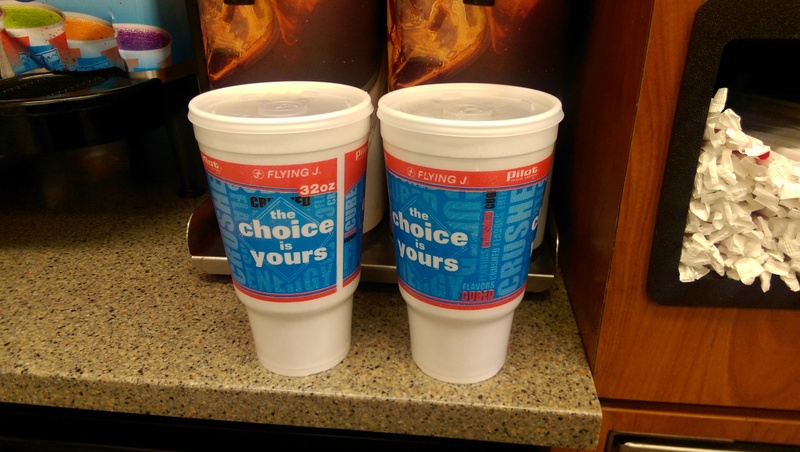 Just $1 for a size large (32 oz.) fountain drink while the medium size remained $1.55. Can’t beat a deal on caffeine in America. Just $1 each! Fully caffeinated, we were ready to cross into state #4 of the trip and begin a little discovering of the surrounding area of the Great Salt Lake. loved your posting of trip through Idaho on the way to Utah. Looking forward to next leg of the trip blog. Thanks! It’s going to be a great adventure! Definitely different from international travel and flying.